This marks the 4th consecutive year Maven Wave has been included on the exclusive list. 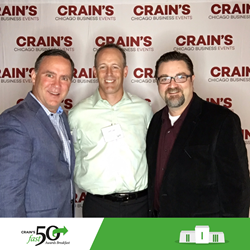 We are thrilled to be included on the Crain’s Fast 50 list for the fourth consecutive year! Maven Wave has landed the #18 spot on the Crain’s Fast 50 list of the fastest growing companies in Chicago! This marks the fourth consecutive year that the company has been included on this exclusive list and the 3rd time being included in the top 20. Previously, Maven Wave was #25 in 2016, #6 in 2015, and #2 in 2014. The Fast 50 businesses have all achieved impressive gains over the last five-years and are ranked by revenue growth. Maven Wave has grown 579% since 2011, which has landed the company a spot on the list for the fourth year in a row. On average, the company doubles in size every 20 months. “We are thrilled to be included on the Crain’s Fast 50 list for the fourth consecutive year. To be successful in the digital world, the enterprise has to evolve and build strengths that meet the needs of today's customer. Maven Wave’s services and solutions help to accelerate our clients digital transformation. Our continued growth can be attributed to demand that is only intensifying over the coming years,” said Jeff Lee, Partner and Co-Founder of Maven Wave. Maven Wave’s growth has largely been driven by the ability to help clients gain the digital competitive advantage they need to stay ahead and meet the needs of today’s customers and employees. A strategic partnership with Google allows Maven Wave to successfully deliver cloud-based digital transformation services to enterprise clients. A huge congratulations to all of the companies on the Fast 50! Maven Wave is honored to be included on this prestigious list. View the full article in Crain’s Chicago Business.